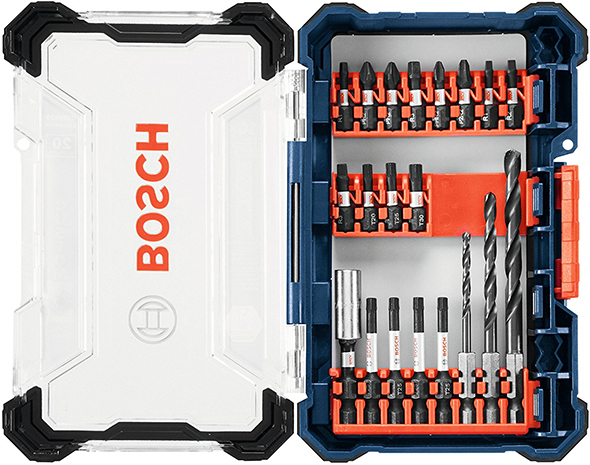 Bosch is coming out with a new Custom Case System, a modular setup for equipping and organizing your drill bits, screwdriver bits, and other such accessories. Right now, the system looks to be limited to Impact Tough bits and accessories. 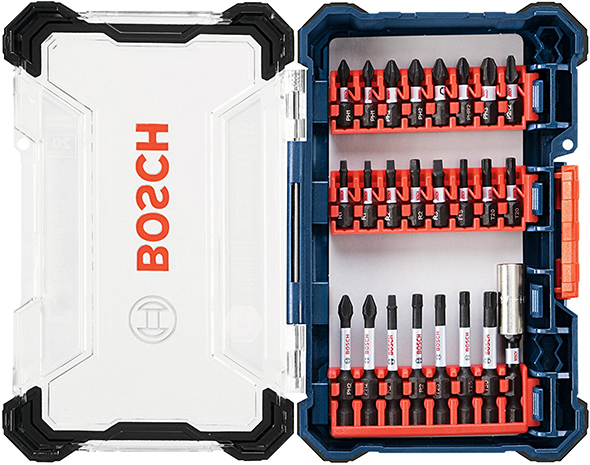 More specifically, the system is centered around a whole new line of next-generation Bosch impact-rated bits, some of which we’ve already been testing and like using. At launch, there will be several starter sets available, and the pricing looks to be quite good. Strangely, the pricing for the empty boxes and individual bit modules is quite a bit higher. I hope that other brands’ accessories can be used with these cases and bit clips, but that’s something we’re going to need to figure out by trial and error. The cases, both inside and out, look to be a step up from your run in the mill plastic bit boxes. On the inside of the large case, there’s room for up to 8 rails to be clipped in, each with a quick release lever in case you want to change bit load outs or carry one bit rail separate from the rest. 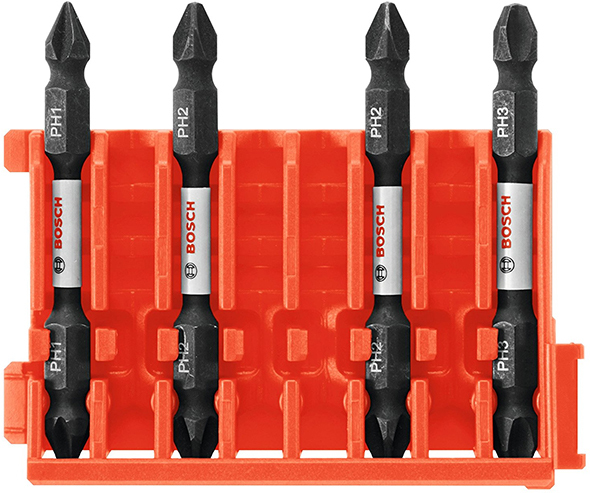 The current selection includes sets with, and accommodations for screwdriver bits, power bits – even long ones such as Bosch’s double-ended bits, drill bits, and nut driving bits. There will be 2 case sizes available, at least to start. In addition to the one shown above, there’s a slimmer case with 4 rail positions and a clear window. Both of the new starter sets are shown with a combination of insert bits and longer power bits or drill bits, allowing for 3 out of 4 rail positions to be used. It’s the same height and width as the larger case, but slimmer. 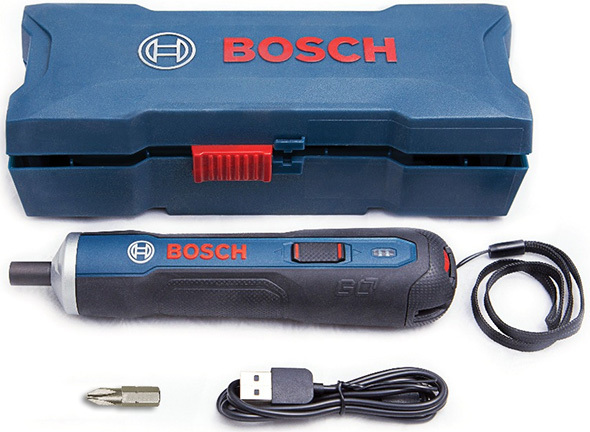 I wonder if Bosch will expand to include additional sizes. Maybe a case that can hold 1 or 2 rails, with a belt clip on the back? A lanyard attachment system? An even larger kit with movable middle panel that has rail placements on both sides? Some of the bit loadout modules you could buy comes with 8 insert bits. Others have 8 power bits. There are also double-ended bits with taller rail clip. There are also rails loaded with nut driver bits, drill bits, or a combination of drill bits and power screwdriver bits. There’s also a clear plastic box for holding loose components – say Phillips #2 bits bought in bulk. 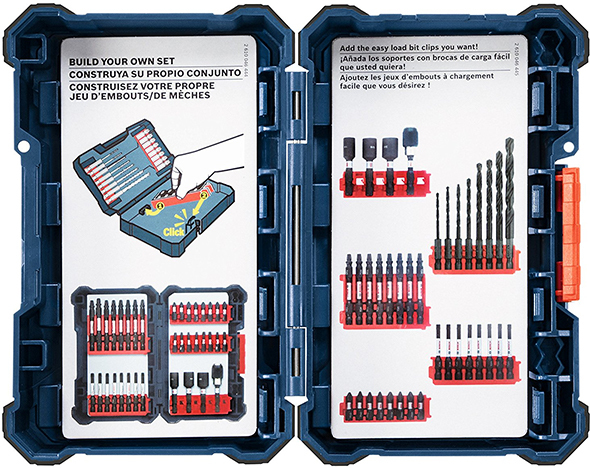 Pricing: $11-13 for the starter bit sets, including a case and bit loadouts. As mention, the pricing is a little strange right now, with the starter sets costing considerably less than if you were to buy any of the individual system components separately. We’ll try to get to the bottom of it. The shipping ETA is 1-2 months, which tends to be Amazon’s default for tools that aren’t immediately available but are expected to launch soon. For the prices Amazon is listing the starter bit kits for, it’s a no-risk situation. 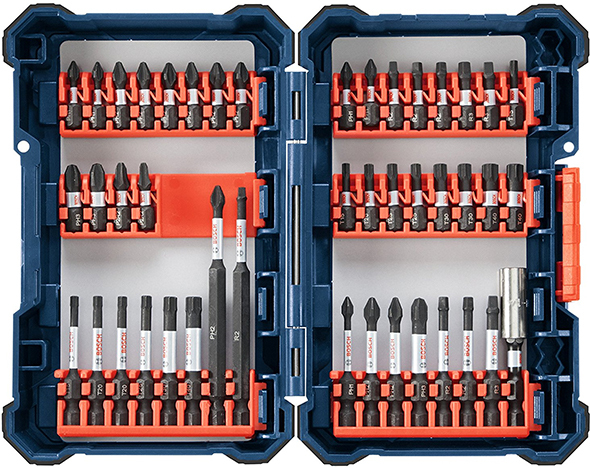 At worst, these are reasonably priced sets of latest-generation impact-rated screwdriver bits (which I’ve tested a little and like so far), in good-looking cases. If the modular bit storage part isn’t appealing, the sets can be used as standalone sets. At best, this new system will allow for more efficient storage and organizing of driving bits, allowing for quick reloads or bit selection swap-outs. Realistically, the usability level will fall somewhere between those extremes for most users. 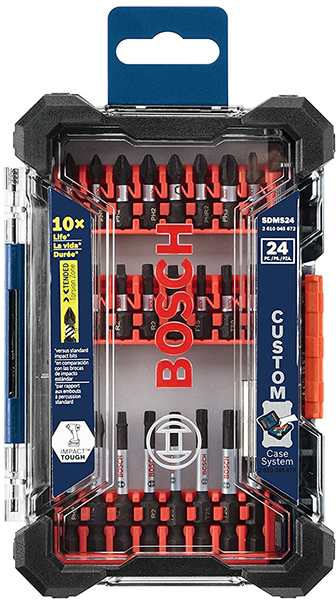 In other words, assuming you like the bit selection in the starter sets, I can’t see any reason not to give the new Custom Case System or new Bosch bits a try. Update: Bosch was able to get back to me with some prices, and from what I can see, the component costs will be a LOT lower than they’re currently listed for on Amazon, and the sets will be a little higher. For instance, the 48pc set has an MSRP of $29.99. The method of ‘snapping’ in the looks like that of a Dewalt kit I have that is absolutely, by far, the worst ever. It’s very difficult to get the bits back in. I hope that that is not the case here, but I wonder…. Ugly, totally opinion of course, but this tough guy space hardware looks belongs more in the Japanese Anime and transformer world than in the work world. But it is popular w/designers….Hitachi esp. but most other companies are using elements of it as well. I guess they didn’t have me in the focus groups. In that vein I still prefer noisy steel drop in drill cases but nearly everything nowadays is 1/4″ hex. Or at least most brand marketers would make it seem. I wonder if fred or someone knows of a metal equivalent for mostly tool bench use? I.e. not plastic. You beat me to the punch. Huot probably still makes a lot of the drill cases that come with US Industrial-Brand drill sets. A quick look on Amazon – also came up with a Vermont American (a Bosch company) and a Titan-branded metal drill index. Little differences can make a huge difference. I’ve had good bit rails, and horrible ones, despite strong visual similarities. With these, I’m optimistic, but there’s no way to know until they start shipping. I agree the styling is over the top. I wish they had spent the effort on a better latch, and adding a place to stick a label on. On the plus side, the white on black bit lettering makes for much easier identification. I think I must have a similar DW case. Far and away my favorite case, as far as bit retention, removal, and insertion is a Craftsman set I got on clearance last winter after Christmas. It isn’t quite as slim but the way the bits go in and out is ingenious compared to this style. To remove a short bit lean the tip towards you a bit and it ‘unsnaps’ so you can pull it out easily. To insert, slide it in its slot so the bottom sits in its little cradle, then tip the top of the bit away from you until it clicks in place. The power driver bit holders hinge li!e a drill bit index does, and the bits can only be removed or inserted when hinged up or out. Otherwise they are locked in place by the detent. I liked it so much I went to get another (or two) a and they were sold out. I asked the sales rep about them and he said he knew the assortment box I was looking for and thought they were discontinued. Sears (Craftrman) had one of the best designs and may have dropped it. If they did, it is yet another gripe I have with Sears. I like my previous gen. Bosch bit cases. These appear to be a bit (oops, pun) heavier duty and/or more glove friendly to access. The “problem” I have with all of these sets by any manufacturer is getting access to direct replacements bits. Always seems an afterthought. Maybe because the set prices are so cheap per bit? Ive been customizing my bit boxes since i can remember, ie moving the slots around, adding/subtracting bits. Looks cool. But it’s not all that different from Dewalt and Milwaukee’s modular bit cases. Except that you can find rails on the market separately (at much higher rates than buying a whole case). And it does seem like the rails are a little easier to remove from the case. I think the cases would be more useful if you can snap them together L-Boxx style, or if they fit actually fit inside a larger L-boxx case. Then they would have something truly unique. 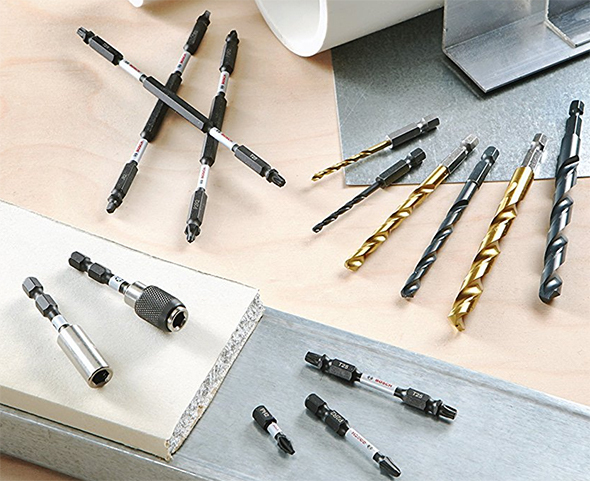 I’ve been using the new Bosch bits for a few weeks now(Menards has had them in stock for about 2 months) and absolutely love them, I’ve been using Makita gold and Milwaukee lately as well and while both are good, I gotta say the Bosch are my preferred bits. A little while back I was consolidating and inventorying all the Milwaukee shockwave bit cases I have. All of a sudden I realized I could rearrange and swap the pieces across cases. Though the Milwaukees like the Dewalts someone mentioned can be a pain to get bits out of. I am shocked to think someone would pay for a bare case a bit trays to go inside. Even if someone buys 25+ packs of bits, doesnt everyone already have tons of cases like these? 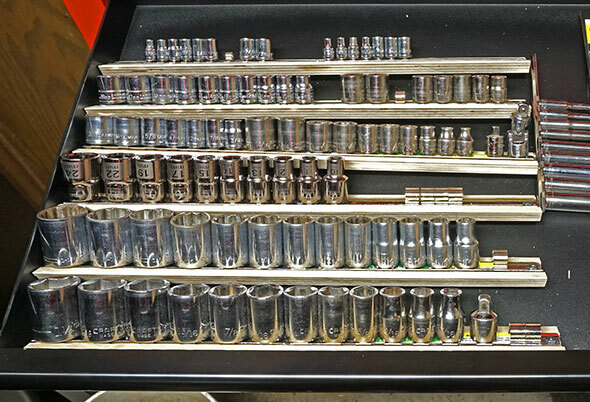 We’d buy assortments one in a while – but mostly PH2 or Robertson#2 – sometimes a Torx – in bulk boxes and the assortments would probably stay on the truck unless the guys ran into an oddball screw. Who copies who? Bosch or Milwaukee? Last week ToolGuyd had an article on the Bosch compact blower – which is a nearly mirror image of that of the Milwaukee. 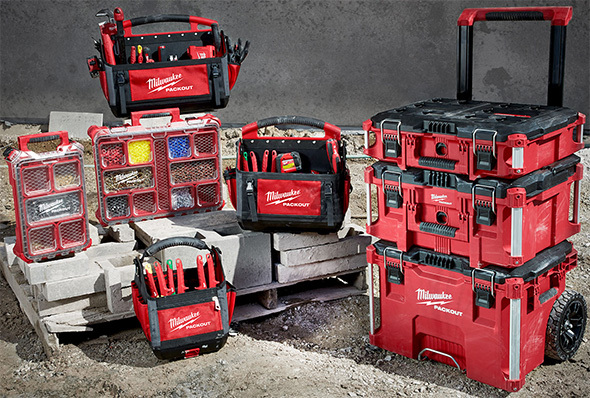 Now these bit kits look almost exactly like the Milwaukee’s too – same case design and bit design. I have the DeWalt version of this bit case at work, and the Milwaukee version at home. They are nice for carrying around but very difficult to get the bits in and out of. I’m ordering two of these from amazon; the price is low enough on the 40pc and 44pc sets is good enough if the bit quality isn’t crap. Getting a good selection of torx and robertson bits in 2″ bit sizes is a bonus. I didn’t see it but can I get an empty case with different clips – because I have most of the bits I’m going to need for a while. For bit storage, Ryobi offers a really nice solution. They offer ~50 positions of vertical 1″ bit storage on the right and a select number of power bit slots on the left. This is nice since you can load up your less frequently used bits as 1″ (e.g. 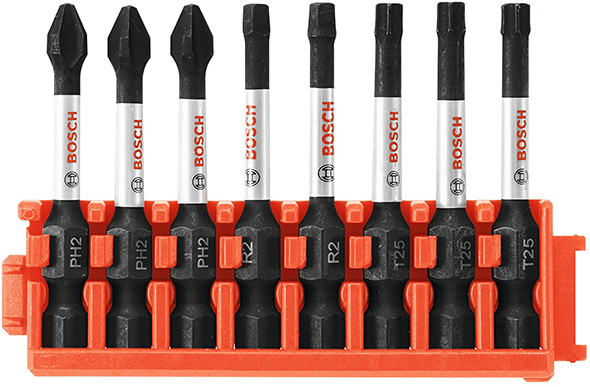 torx) and more frequently used bits in both 1″ and power bit form factors. I replaced the standard Ryobi bits with Dewalt impact rated bits since they off strong magnetic screw holding capability and excellent tips. It looks like they may be offering an impact rated kit now, although the old kit I bought was almost all 1″ bits on the right. 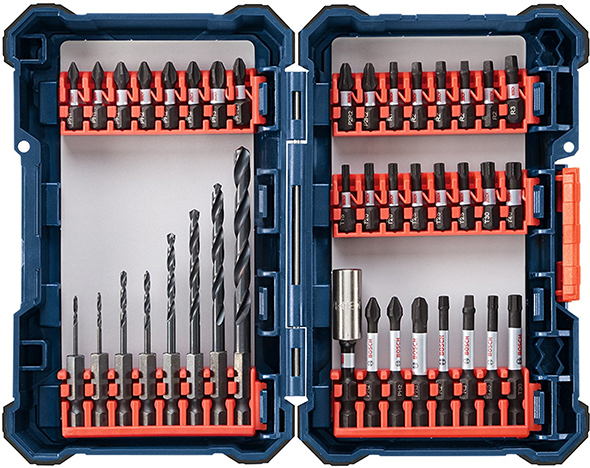 For mobile drill indexes, Bosch sets have very handy holes to test the diameter you need before removing the drill bit as well as a tilt out capability for easy drill bit removal. 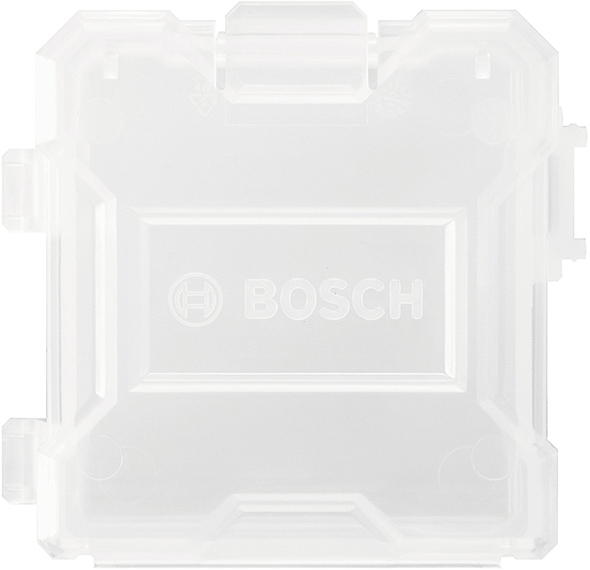 For jigsaw blade storage, Bosch sets have handy slots and self-closing lids. I’ve tried some similar Dewalt storage and it was very tough to open the internal lids. For recip saw blade storaeg, Milwaukee sells nice saw blade holders with swingout and extension features. I stick mostly to DeWalt bit set tough cases. All customizable, but with the drawback of it being a sardine can of sorts. You’re actually supposed to slide the bits in from top into each rail slot, but most people seem to try the hard way of pushing it from front. 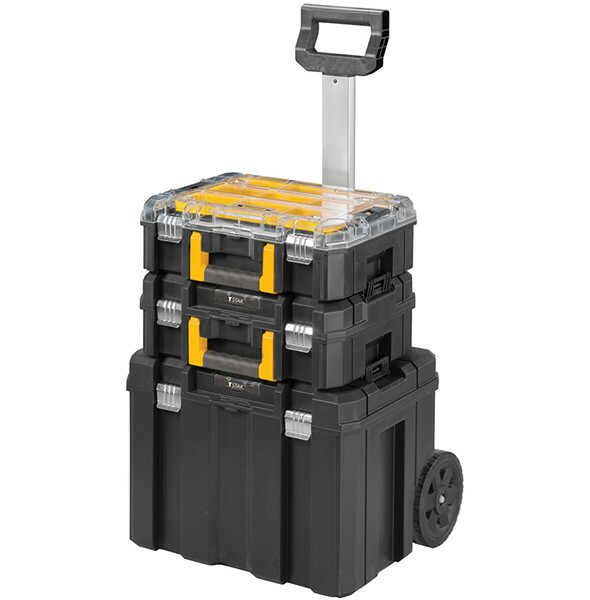 No system is perfect but at least with the tradeoff with DeWalt is that I can store 10 tough cases into one TSTAKIII with room for those puck size PH2 containers and tiktic shape ones too. I like the bits from Milwaukee and Dewalt ok, but I hate their cases. Sometimes it seems the biggest part of a simple job is wrestling to get the bits out and back in. Ok, so 3 minutes to put up the new smoke alarm with 2 screws. 10 minutes to get the bits out and put them back in. Exaggeration, but still. . . . I often just leave them stuck in halfway because it’s so frustrating. I have a recent Kobalt set. I don’t like their bits as well as other brands, but their case is so easy to remove and put back the bits, I find myself using that one more. I’ll be interested to see if this new case is any different. I’m hoping they did the smart thing. Oops, I meant Milwaukee and Bosch, though it’s also true of dewalt. 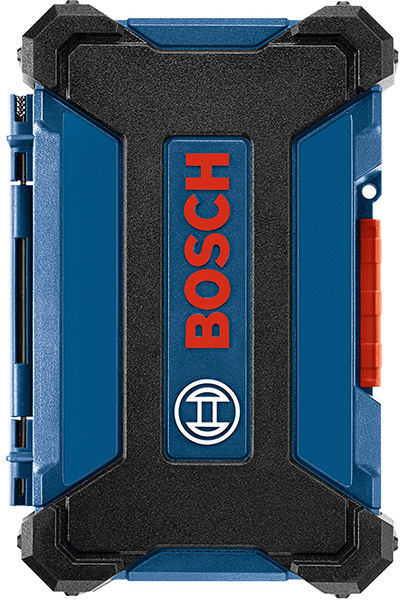 Also those plastic covers on the Bosch cases that are supposed to hold things in place are just an annoyance. They never stay in place and more trouble than they’re worth. If you want something useful to put bits in, go to the sporting goods aisle at Walmart and get one of those clear small tackle boxes with dividers. I’ve been using them for years for all of bits. As far as having to pluck bits in and out of some undersized modular case, that’s for the birds. I liked more the gray version the rest of the world are getting. At this price I can’t turn it down. I currently have a set of DeWalt impact bits and I’ve chewed up a few of the PH2 last year prepping and dismantling around Hurricane Matthew. I was eyeing the Makita Impact X, but these are priced even better so may give this a shot and see how it goes. Just FYI, Amazon has already started adjusting these prices. Instead of $11-13 for the starter sets they’re more like $26-32. I’ve been forgetting to place an order, so I did just now. Some of the starter sets are still $11-13. Luckily, those are the ones I was interested in. I ordered 2 compact sets and 2 larger sets. Maybe one set for me to try out, and another for a giveaway. I should point out that, if these are price mistakes, there’s a chance Amazon could cancel orders. Nobody should get greedy and order 10x, or anything like that. You’re right, I did grab 2 of the ones that were still lower and we’ll see if they stay true to it. I figured I might as well get one of those with the pieces I want to add in (the nutsetter set) as it would still be cheaper than buying an empty case. Received a set (the 1st 2 pictures above). Love the vertical insertions of bits then rotate to horizontal position. This is much easier than the Dewalt and other non rotating designs.